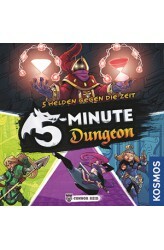 5-­Minute Dungeon is a chaotic, co-­operative, real-­time card game in which players have only five minutes to escape the randomized dungeon. Communication and teamwork are critical to survival because there's no time to form a carefully considered plan — and no predicting what dangers lie ahead. In more detail, players assume the role of one of ten heroes, each with special cards and abilities. Once the five-minute timer starts, the race is on to defeat all the monsters inside the dungeon. In order to defeat a monster, players must match symbols from their hand with ones on the monster's card. At the end of each dungeon is a powerful dungeon boss — and after the first boss is defeated, the campaign continues to the second boss. Each boss, and each randomized dungeon, gets hard.. In the puzzle game Dimension six task cards are laid out each round, with these cards dictating how the balls in the game should be stacked on top of one another and side to side. These challenges aren't easy as some colors shouldn't touch one another. Fast puzzle-solving is important, but more than that in the end whoever solves the most of these difficult tasks wins. 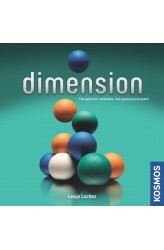 NOTE: IMPORTANT RULE CORRECTION Game description from the Thames & Kosmos 2015 Science Kits & Games catalogue: Dimension The Spherical, Stackable, Fast-Paced Puzzle Game! Dimension is a fast-paced, innovative puzzle game that takes place in three dimensions with 60 colourful spheres. All of the players play at the same time. Everybody tries to position the spheres on .. 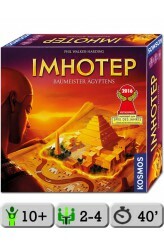 In Imhotep, the players become builders in Egypt who want to emulate the first and best-known architect there, namely Imhotep. Over six rounds, they move wooden stones by boat to create five seminal monuments, and on a turn, a player chooses one of four actions: Procure new stones, load stones on a boat, bring a boat to a monument, or play an action card. While this sounds easy, naturally the other players constantly thwart your building plans by carrying out plans of their own. Only those with the best timing — and the stones to back up their plans — will prove to be Egypt's best builder. 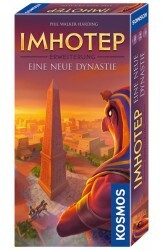 https://youtu.be/Ezdqba0fhdM ..
Imhotep: Eine neue Dynastie adds five new places, fourteen market cards, seven god cards, four chariots, and 56 tiles to the Imhotep base game. God cards let players predict the progress of different buildings, with them being rewarded at the end of the game if they're correct and otherwise being punished. ..
De bewezen klassieker is terug: inmiddels meer dan 180.000 exemplaren verkocht! Ergens in de Stille Zuidzee voeren twee Kahuna-priesters de strijd over twallf kleine eilanden. 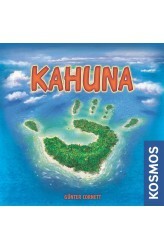 Met behulp van de zeldzame Kahuna magie proberen zij de eilanden onder hun invloed te krijgen. Wie van hen zal deze strijd winnen? Gebruik je kaarten om invloed te krijgen op de eilanden en de macht van je tegenstander te breken. Tactiek en een goede planning leiden tot een overwinning in deze magische strijd. 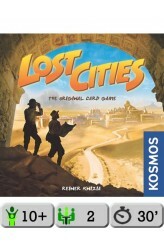 http://www.youtube.com/watch?v=rG4V5Zdji5Q ..
Lost Cities is a card game in the Kosmos two-player series. The game consists of a single deck of cards of rank 2–10 in 5 different colors with 3 special "handshakes" ("HS" in scoring examples below) in each suit. There is also a board which functions only to hold and organize discarded cards and is largely superfluous. Games last around 15 minutes. This is generally considered a good "couples" game and is often recommended for people with non-gamer partners. The object the game is to gain points by mounting profitable archaeological expeditions to the different sites represented by the 5 colors. On a player's turn they must always first play one card, either to an expedition or by discarding it to the appropriate discard pile, and then draw one card. There is a separate discard pil.. 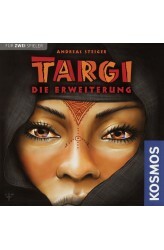 The expansion of the tribe goes on in Targi: Die Erweiterung, an expansion for Targi. With water as a new element, the tribe has more flexibility in how it will extend itself. More specifically, in the game water functions like a joker, e.g., you can swap two water tokens for any one goods token. Many of the new tribe cards, which replace the set in the base game, allow players to choose to spend gold or water tokens, which can make it a little easier to build. The Targia — a Tuareg woman — is a special pawn like the robber, but has a more positive effect for players. She starts in the opposite direction of the robber and moves each turn one edge card. When you place one of your Targi on the same card, you receive a favor: Either take a goods token of your choice or spend ..
"EAT, YELLOW, CIRCLE — do you mean pancakes? Or pineapple rings? Oh wait, the CIRCLE is DIVIDED? So something that you eat that is yellow and semicircular? Uh, is it, maybe…a banana?" "Yes, the answer is banana! One point for the Blue Team!" 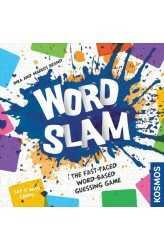 In the communication game Word Slam, two teams compete against one another simultaneously. In each round, one player on each team tries to get their teammates to guess a hidden word or phrase using only the 105 explanatory cards available in the box. Speaking and acting is absolutely forbidden for the storytellers! They must tell their stories using only 105 cards, each with one word on it: a noun, verb, adjective, or preposition. A player can use as many explanatory cards as desired, and whichever team guesses correctly first scores a poin..